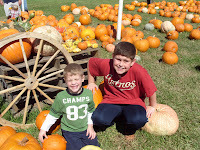 Saturday Hubs and I took the boys to the pumpkin patch to take a few pictures. A local church puts on this event every year. 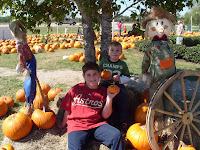 R2's pre-school took a field trip to the pumpkin patch. And he was sick that day, and I didn't want him to miss going so I made the decision on the next nice weekend we would go. This weekends weather did not disappoint. It was beautiful!!! They are so cute. And growing right before my eyes RR Mama : ) Right before my eyes. Do you know that we have had horrible rainy days every weekend in October! 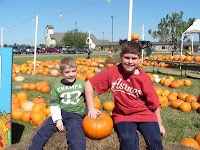 I am praying today is nice so we can pop over to the Pumpkin Patch. Gary is working but I would still like to go! 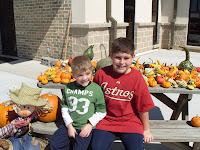 Can not believe October is almost over. This month is FLYING!